Illustration of a density slice in two MHD turbulence simulations with the same sonic Mach number of approximately 0.5 for the two extreme cases of forcing parameters used our forcing study. The left panel shows a simulation driven by a delta-in-time (i.e., uncorrelated) acceleration field whose amplitude is normalized to provide a constant (in time) energy injection rate. The right panel shows a simulation driven by an acceleration field governed by a stochastic Ornstein-Uhlenbeck process with an autocorrelation time equal to a dynamical time and constant amplitude. The time evolution covers five large scale eddy turnover times starting from uniform initial conditions with the fluid at rest. In the stationary regime (after 2.5T) the simulations are subsonic and super-Alfvenic. More information can be found in the corresponding paper. To download the video use a right-click on the video and select “Save video as”. The video illustrates the shell decomposition we used to study energy transfer between different scales (eddies of different sizes) in compressible MHD turbulence. Eddies are shown based on the Q-criterion and filtered to indicate regions where the flow is dominated by rotational motion. The top left panel includes information of all spatial scales. The other panels include information of only one individual “shell” with decreasing spatial size from top right, to bottom left, to bottom right. The time evolution covers five large scale eddy turnover times starting from uniform initial conditions with the fluid at rest. In the stationary regime (after 2.5T) the simulations are subsonic and super-Alfvenic. More information can be found in our corresponding paper. The image displays the magnetic energy in a turbulence simulation. The top left panel shows all relevant scales. Typically only a coarser level of detail can be resolved in a simulation (top right). 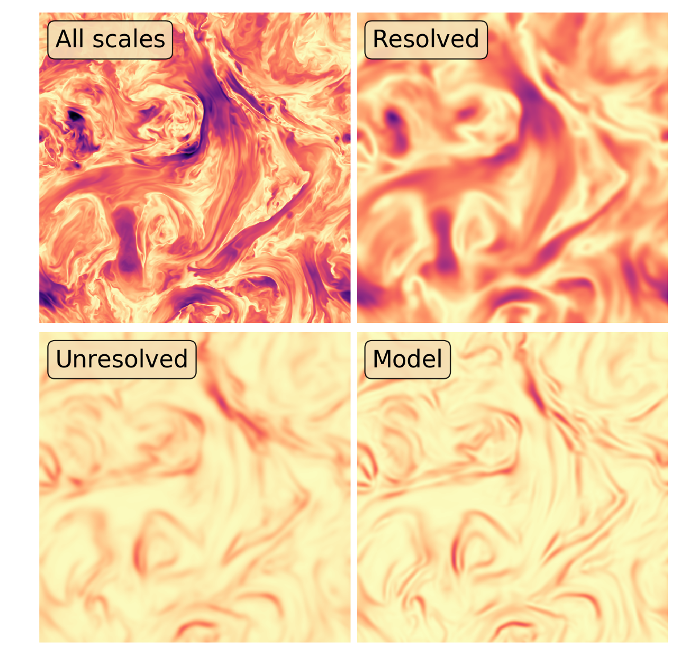 Effects from the unresolved scales (bottom left) are missing in those simulations. The subgrid-scale model we proposed and verified (see research) is capable to account for those effects and allows to reintroduce them to the simulation. Created by Philipp Grete with Jekyll based on Feeling Responsive.